Host Jeffrey Victor, star of Arts Club’s Les Miserables and White Christmas, together with Geoff Campbell, Lauren Bowler, Jennifer McLaren, Brennan Cuff, and Rnold Smith, remembered the good old days when music had melody and wonderful lyrics. 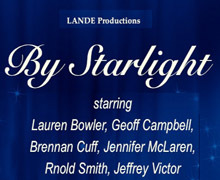 Accompanied on the piano by Producer and Music Director Larry Enns, the concert featured songs like "Pennies from Heaven", "Mood Indigo", "I’m Getting Sentimental Over You", "Moonlight Becomes You", and many more classics from the American Songbook Hits. In his programme notes, Enns says: "Tonight's cast continues to instill that initial feeling I had over 50 years ago." I personally felt the same way Enns felt as I listened to these songs which were my parents' songs. I remember my mom telling me that dad's favorite when he was fighting in World War II was "I'll Be Seeing You", as he always thought of mom before they got married. And as I was growing up in the 50s, our phonograph had all those 33 rpm records featuring Frank Sinatra, Bing Crosby, Duke Ellington, and many of those greats of yesteryears. This concert brought back memories and a smile in my face as I listened to these young, talented singers sing those beautiful songs of Ned Washington, Lorenz Hart, Frank Loesser, Ivor Novello, Johnny Burke, Howard Dietz, Anthony Newley, Sammy Cahn, Kander & Ebb, Duke Ellington, Jeremy Nicholas, and Alan Jay Lerner. The audience even participated in the encore number, Sammy Cahn's "It's Been a Long, Long Time".